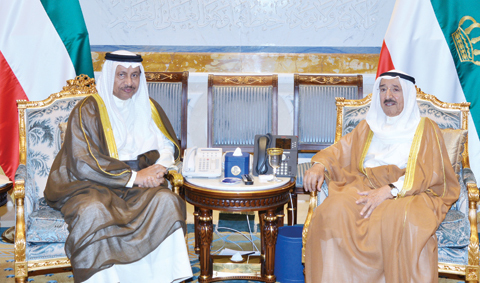 KUWAIT: Two days after the government’s resignation, HH the Amir Sheikh Sabah Al-Ahmad Al-Sabah yesterday asked the outgoing prime minister to form the new Cabinet. HH Sheikh Jaber Al-Mubarak Al-Sabah submitted his Cabinet’s resignation to the Amir on Monday following a political dispute with the National Assembly after 10 lawmakers filed a no-confidence motion against a minister after a lengthy grilling over alleged financial and administrative violations. Minister of State for Cabinet Affairs and acting Information Minister Sheikh Mohammad Al-Abdullah Al-Sabah, who was grilled, categorically denied the allegations. The Cabinet stepped down after a large number of MPs declared their support for the no-confidence motion, which meant he could have been voted out of office. The new Cabinet will be the 35th since Kuwait’s parliamentary life began in 1962 and is Sheikh Jaber’s seventh government since he was appointed to the post in Dec 2011. No deadline has been given for the formation of the Cabinet amid reports that it could take longer than normal. Even before Sheikh Jaber was asked to form the Cabinet, lawmakers had emphasized the need for a better selection of ministers and a change of the previous methodology to pick up competent and efficient ministers to avoid disputes with MPs. Several lawmakers had insisted the need to take into account the fast and grave developments in the region and the risks that the Gulf Cooperation Council (GCC) could collapse over the Qatar rift. Yesterday however, MPs and groups stepped up the pressure. The liberal National Democratic Alliance (NDA) warned that retaining Sheikh Mohammad in his previous post or in any other portfolio will trigger a fresh political crisis. The group urged the prime minister not to aim to appoint ministers who represent various wings of the ruling family or appoint more members from the ruling family rather than competent ministers. It warned that this will lead to more problems. Opposition lawmaker Mubarak Al-Hajraf warned that if the Minister of Social Affairs and Labor Hind Al-Sabeeh is retained in the Cabinet, he will file to grill her, adding that her grilling is ready. Meanwhile, MP Safa Al-Hashem said yesterday she has proposed to form a high-level delegation comprising the speakers of parliaments in the GCC to meet GCC leaders in a bid to mediate a settlement over the Qatar crisis. She said that she is confident that Assembly Speaker Marzouq Al-Ghanem will embrace the proposal through the Assembly’s foreign relations committee.